I've enjoyed this disc a lot and return to complete playings of it with pleasure (...). 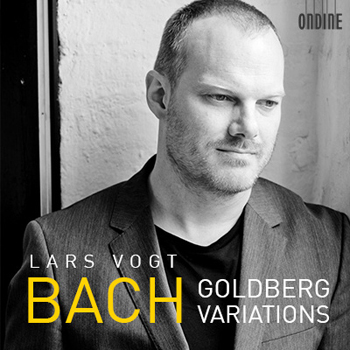 Lars Vogt is an artist with much to communicate, and this is a distinguished addition to the discography of the 'Goldberg Variations' in all their glorious elegance. A distinguished addition to the discography (...). Lars Vogt makes us celebrate the work as an extraordinary momument (...). He takes delight in all its aspects and challenges and conveys a sense of the pleasure it must have been for Bach to write. Pianist Lars Vogt presents one of the classic works of the Baroque repertoire - Johann Sebastian Bach's (1685-1750) famous Goldberg Variations. 1741, embody an Aria with 30 variations and a coda. Bach wrote the work for Johann Gottlieb Goldberg, who, as the narrative says, often played music as a cure for Count Kaiserling's insomnia. Apparently the work was one of the successes that Bach had during his lifetime and it was also published during his lifetime. "For starters, one has to ‘de-sanctify' the work for oneself. One has to take a step back and simply take it as a piece that Bach thought out at that time. He didn't necessarily want to leave a last will and testament. I believe that he simply took delight in the experiment of constructing canons around these variations, of experimenting structurally. For example, the relevance of the numbers, which means that here the theme consists of thirty-two measures and the work of thirty-two pieces, the groups of three always end with a canon, and a quodlibet occurs at the conclusion. I think he had fun with that. One hears it in this music. For this reason I would place the greatest emphasis on delight and fun. Of course there are a couple of dramatic outbursts and occasionally also great sorrow, but the positive element predominates. The aria too is no squeezing out of meaning, no romantic supercharging, but a simple, pretty piece of music. Great significance does not much belong here. The significance is produced on its own."